Richard Hays is a leading NT scholar, well-known for works such as Echoes of Scripture in the Letters of Paul and The Moral Vision of the New Testament. For some time now, Hays has been at work on a highly-anticipated project regarding the Gospels’ use of the Old Testament through quotation, allusion and echo. Naturally, this is an immense task, and as Hays continues the project he has released Reading Backwards as a “sort of progress report” (ix). So what is Reading Backwards? It is an examination of how the fourfold Gospels use the Old Testament in their representation of Jesus. Basically it is a work on the Christology of the Gospels, focusing on their Old Testament use. Such a work is an ambitious proposal in itself, especially considering the 172-page count. This brevity should not put the reader off, however, as Reading Backwards covers a lot of ground and makes a compelling case for a “high” Christology in each of the four Gospels. Hays does not simply examine each Old Testament quotation in the Gospels, but seeks to establish verbal allusions and echoes as well, presupposing that “all four canonical Gospels are deeply embedded in a symbolic world shaped by the Old Testament” (xii). 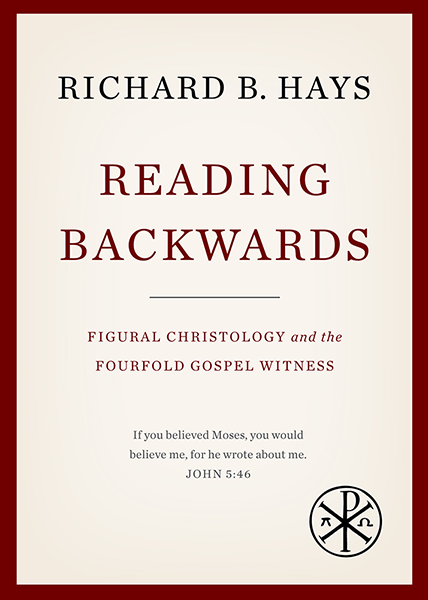 Hays believes that the Gospels present a “figural Christology”, that is, their presentation of Jesus requires a reading backwards to find meaning in the Old Testament. Jesus’ ministry is filled with all kinds of Old Testament significance and the Gospel writers saw Old Testament events and concepts as a quiver from which to draw. This reading backwards should not lead one to reject the original context, but rather “find in it a significance beyond that which anyone could previously have grasped” (xv), which then in turn allows one to re-read the Gospels in light of the Old Testament. After recognizing his own indebtedness to academic forerunners, Hays proceeds to examine the Gospels one-by-one in the order of Mark, Matthew, Luke and John. With each Gospel, Hays establishes the unique way(s) in which it uses the Old Testament, and then follows with important examples. An example from the Gospel of Mark should suffice. Mark mostly draws on the Old Testament “through hints and allusions, giving just enough clues to tease the reader into further exploration and reflection” (p17). Mark prefers to highlight the mystery of Jesus’ identity and shapes his whole Gospel accordingly. As an example, when Jesus stills the storm, Mark ends the pericope with the disciples asking themselves “who then is this?” (Mark 4:41). Mark provokes the reader to ask the same question. Upon reflection, OT passages such as Psalm 107:23-32 make it clear that “[Jesus] is the possessor of a power that the OT consistently assigns to the LORD God alone” (23). In his conclusion, Hays raises some natural questions. First, how do the Gospels’ use of the Old Testament compare to each other? Hays makes an excellent case that the Gospels use the Old Testament differently from one another, but I was a little uncomfortable with some of Hays’ conclusions since he argued for a level of discontinuity and even disagreement in their interpretative approaches. It is one thing to notice different rhetorical and literary strategies and another to say that they “do not speak in unison as interpreters of the OT” (95). This is less harmony than I would see; I would expect that if one sat the Gospel writers together in a room, they would appreciate each others’ distinct flavours and be in agreement with their underlying presuppositions. However, I do recognize this as a distinctly evangelical concern and it is not a major point in Hays’ thesis, so I will not press the point further. Both fascinating and problematic at the same time was where Hays surveys the distinct approaches to the OT in each Gospel and then offers his opinions to the “strengths and weaknesses” (96) of each Gospel. For example, Mark’s veiled and subtle approach has the strength of artful and evocative power has unfortunate weakness of allowing readers and even NT critics (97!) to miss the nature of Jesus’ identity. Hays’ survey lets each voice be heard clearly and draws out some worthy points for readers, but again, my attitude towards Scripture had me uncomfortable sitting in in any sort of judgment over so-called “weaknesses” in the Gospel writers approaches. In regards to Hays’ conclusions of divine identity, I could not find myself in more agreement. Hays presents a simple but persuasive cumulative case that shows each of the Gospels possess a “high” Christology indeed, so much so that he argues that the “high” and “low” categories ought to be rejected. Hays is relentless in allowing the text to speak, even when taking unpopular positions in scholarship regarding the (lack of) Jesus’ deity in the synoptics. While I find much to agree with, I have some reservations. For example, Hays seems to read the Old Testament in such a way that Jesus is only present a) in retrospect and b) through a typological (or “figural” reading). That is to say, the Old Testament does not predict Jesus as much as it foreshadows Him. In Hays’ own words, “it would be a hermeneutical blunder to read the Law and the Prophets as deliberately predicting events in the life of Jesus” but that “it is both right and illuminating to read backwards and to discover in the Law and the Prophets an unexpected foreshadowing of the later story” (p94, emphasis in original). Such an attitude that rejects OT prediction seems at odds with Jesus’ accusation that His opponents should have known better (John 5:39) than to reject Him. I’m not sure how such statements make sense if Christ can only be found in the OT through a retrospective reading of texts about other characters and events in their original context. Hays also hints that this allows other interpretative perspectives to have validity. However, Jesus does not criticize His opponents for taking a “different view”, but accuses them of not reading the Scriptures at all! In some ways I think Reading Backwards sells itself short. It is a wonderful little book that manages to do so much, but it is compiled from a series of lectures with lines such as “in the previous lecture”. If Hays had adjusted the book to remove such obvious references to its original context, this could allow the book the greater legacy that it deserves. As a comprehensive treatment of the Old Testament’s witness to Jesus, I would recommend supplementing Reading Backwards with other works such as Jesus the Messiah, The Messianic Hope, or even Dominion and Dynasty, all books that portray the Old Testament as predicting Jesus in various ways. Not wanting to simply give us a book full of fish but then leave us to starve on our own when we finish it, Hays concludes the book with 10 strategies for how to read Scripture as the Gospel writers did. In the end of the day, we should all want to read the Gospels (and Bible!) better, and Reading Backwards is a help towards this noble end. Many thanks to Baylor University Press for providing a copy of this book in exchange for a review. Their generosity has not affected my review.